This chapter is included in the What is data protection? E-Book. 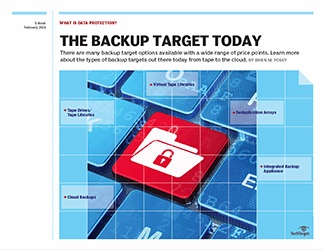 There are many backup target options available with a wide range of price points. They include everything from tape drives and tape libraries to virtual tape libraries, deduplication arrays, integrated backup appliances and cloud backups. Tape drives have been the standard backup target for decades. Virtual tape libraries are designed to make disk-based storage space look as if it were a tape library to backup software. 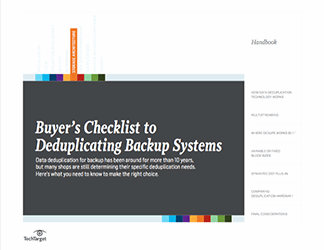 Deduplication arrays allow organizations to protect a data set that is growing exponentially. Integrated backup appliances are designed to act as an "all-in-one" backup approach. 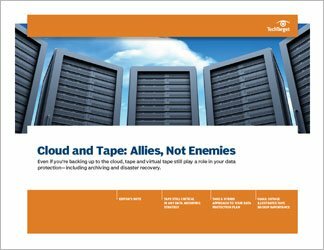 Cloud backups are either Backup as a Service or a backup target. Backups today hardly resemble those from the not-too-distant past. When choosing a modern backup approach, it is important to remember that every approach has advantages and disadvantages that must be considered.